Place: Splash (1700 2nd Avenue, Suite 1, Rock Island). 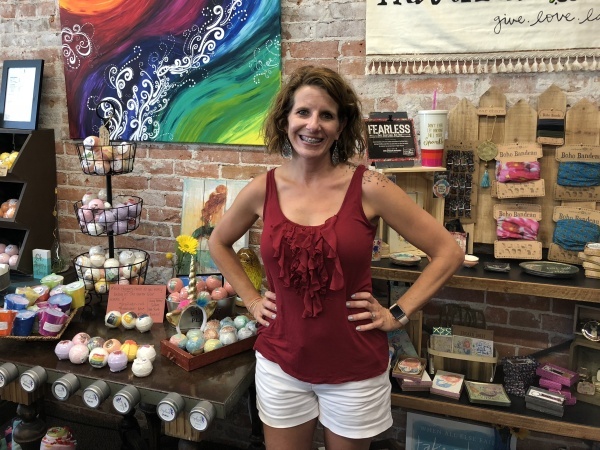 The shop offers items like bath bombs, shower bombs, soaps, and more that are made in-house, as well as other gifts and accessories. As of writing, Splash is open Tuesday- Friday 10 am - 5:30 pm and Saturday 10 am - 5 pm (closed Sunday and Monday). Christiana in her colorful and wonderful-smelling store. Do you ever get caught up in the hustle and bustle of everyday life and forget to take time to yourself? I'm telling you: a bath bomb is an amazing excuse to unplug for a bit and just relax. I have to confess that I had never used a bath bomb before last week, but I am now completely sold on them. The scents, the sounds, everything. Ahhhh. Before she was a splash bomb superstar, Christiana worked as a mental health and addictions counselor in a residential treatment center. Between her many hours on the job and family obligations, she found that she wasn't taking time to practice the self-care and other techniques that she taught every day. "I was working a ton and not taking care of myself, and I had a really hard time separating work and personal life," Christiana said. About 4 years ago, her husband offered her a job in his business, and she jumped at the opportunity. It was around that time that the idea of product self-care products for others started to form. After selling her products online for a while, Christiana became convinced that the smell and color are an important part of the buying process, so about a year ago, she took the plunge and opened her shop. Her products give you an excuse to pamper yourself, even during your daily routine. The shower bombs fizz like a bath bomb and make your shower smell great, but don't require you you to fill up your tub and can be used several times. These products are available in many scents - the shop is a great place to sniff out what's new! One of Splash's latest products! I could definitely use some of this. Like pretty much every conversation I have with fellow small business owners, our chat veered into the elusive balance between growing a business while not letting it completely take over your life. "We make everything here in the shop now, so it allows me to be productive and get stuff done while I'm here and not think about it as much when I'm at home," Christiana said. Christiana is proud to operate her business in Rock Island and when she's out in the community, she finds that people are often surprised to find out that they are located in downtown Rock Island. There are a lot of cool shops down there, so I encourage you to stop in! Thanks, Christiana! Check out Splash in downtown Rock Island.